File photo of a ballot box in front of the Idaho flag. As Idaho polls close on Tuesday, Nov. 6, KTVB.COM will have the latest live Idaho election results. BOISE — Idaho's governor race and two high-profile statewide ballot propositions appear to have been boosting voter interest and turnout across the state. KTVB will have complete Election Day coverage Tuesday, including live election results on KTVB.COM as soon as polls close. Channel 7 and KTVB.COM will have live and commercial-free Election Day coverage from 9 to 10 p.m. We will also stream our coverage on KTVB's free digital cable channel Idaho's Very Own 24/7, Facebook and YouTube until 10 p.m., when the news at 10 p.m. begins on Channel 7. After the 10 p.m. newscast, we will continue our live Election Day coverage on KTVB.COM. We will also have a live blog featuring tweets from KTVB staff as they cover the biggest races in the Treasure Valley. Do you know how to find your polling location? 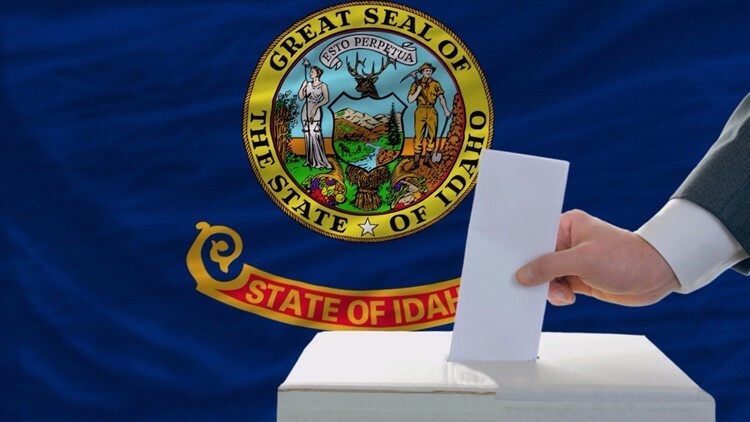 Residents can use the Idaho Secretary of State website, IdahoVotes.gov, to find their polling location and additional voter resources, including identification requirements and what you need to bring with you if you are registering to vote at the Idaho polls on Election Day. Need an Election Day ride to the polls? Uber and Lyft both say they will offer free or discounted rides to polling places Tuesday. The Lime e-scooters are also offering a promotion to and from polling places.